John was born on October 26, 1951, in Poughkeepsie New York. He moved to Lexington Kentucky in 1957 with his Parents. In 1964, John got his first Guitar and soon after was playing in bands with friends around his neighborhood. In 1970, John went to the University of Kentucky to major in stand-up Bass but soon realized that he was thinking in terms of Melody, "I knew that if I was going to work I needed to find a melody instrument." John Had already begun playing the Lap Steel in addition to bass guitar so the move to pedal steel seemed logical. John practiced day and night, brought his guitar home every night from a job, and listened to as much steel as possible. "Some of his early influences were Don Helms, Buddy Charlton and of course the master at being commercial Mr. Pete Drake." John played throughout the United States and Canada with many Groups including his own "Second Hand Rose," which played at the DJ Convention in 1974 at the "Peavey Room, King of the road hotel," and also the group had a spot on the "Grand Ole Opry 50th Anniversary" radio show. Earlier in 74 John played for an audition to be one of the first Steel players at Opryland, John passed the audition but decided to work with his own group on his own music projects. In March 1979 John left for Brussels, Belgium to play & tour with various groups that he had made contact with. In 1980 John moved to Germany, and in 1981 moved to West Berlin where he played with the group "Western Union." WU Released 3 albums and 7 singles and were two time winners of the prestigious Marlboro Competition for West Germany, John toured through out Europe with the group. 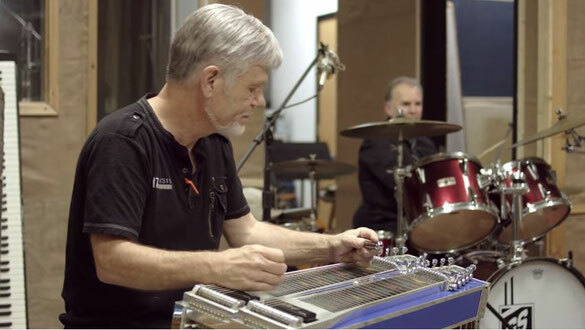 In 1983, John was the featured Steel Guitarist for Germany's first "Steel Guitar Seminar." While in Europe John started to play the Flute and Saxophone. In 1985 John returned back to the USA and immediately went to Nashville. Here John worked at the World Famous Stockyard/Bullpen Lounge from April of 86 till November of 95. While there many artists would come by to sit in with the band, those included Jerry Lee Lewis, The Beach Boys, Reba McEntire, The Everly Brothers, Lorrie Morgan, The Kentucky Headhunters, Rick Astley, Steppenwolf's John Kay, Travis Tritt, Shania Twain, and many others. In 1991 John took a three month leave of absence from the Bullpen lounge to work with "Hank Williams Jr.."
In 1999, John recorded saxophone at the famous "Fame Studio's," in Muscle Shoals, Alabama with "Wayne Jackson," the Trumpet/leader of the "Memphis Horns," on a session for the famous country group "ALABAMA," with producer "Rick Hall". This studio is where all the "Stax Records" songs such as, "Knock On Wood," "Dock Of The Bay" and "Soul Man" were recorded and produced. Today, John is a studio musician in Nashville, his talents on the Steel Guitar, Saxophone, Dobro and Flute, have made him in demand. John is the staff Steel Guitarist for the renown "Gene Breeden Studios," on Music Row. John says "I have many friends around the world today thanks to the Steel Guitar and music," Heiko Aehle is a friend of John's that lives in Germany. John says, "I was trying to contact the North Tennessee Steel Guitar Assoc. on my computer and when I typed in the address and clicked on 'go," Heiko's Home page came up and after e-mailing with him, found out that he lives in the same area of Germany that my family the HEINRICH's came out of in the Eighteen Hundreds"! "Heiko and I probably would have known each other long ago or played in the same bands if my family had never immigrated." John recently was presented a custom EXCEL Steel Guitar built by Mitsuo Fujii, President and Owner of the "Fuzzy Steel Guitar Products Company," in Tokyo Japan. John considers it a great honor to be presented this beautiful guitar and Full Endorsement! from the makers of such a high quality instrument.